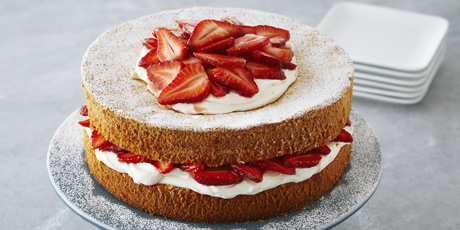 You might also like these Strawberry Desserts to Celebrate Summer. 1. Preheat the oven to 325 F. Line the bottom of a 9-inch springform pan with parchment paper, but do not grease the pan. 2. Whip the eggs and sugar on high speed until they are almost white in colour, more than triple in volume and hold a ribbon when the beaters are lifted, about 5 minutes. On medium speed, add the zest and juice. 3. Sift the flour and salt and, still on medium speed, add the flour. Spoon about a cup of the batter into a bowl, and stir in the melted butter and vanilla. Add this all back to the full batter and stir until blended. Pour the batter into the prepared pan and bake for about 40 minutes, until the centre of the cake springs back when gently pressed. Cool the cake completely in the pan. 1. For the cream, whip the cream until it holds a soft peak when the beaters are lifted. In a separate bowl, beat the cream cheese to soften, and beat in the sugar, lemon juice and vanilla or vanilla bean paste. Fold in the whipped cream in 2 additions. Chill until ready to assemble. 2. When ready to assemble the cake, stir the berries with the jam to coat. Run a palette knife around the inside edge of the cake pan to loosen it, then remove it from the pan and peel off the parchment paper. Slice the cake in half horizontally. Spread half of the cream over the cake and top with half of the berries. Place the top of the cake over the berries, and top this with the remaining cream and berries, leaving an inch or two of the cake exposed around the outside edge. Dust this edge with icing sugar and chill until ready to serve. 3. The cake can be assembled up to 4 hours in advance.